From time to time I will spot something that will make your life easier, healthier, richer, simpler, more fun – or more organized. This blog relates to the latter. Introducing: MagnaPods, a line of high quality plastic storage units that magnetically adhere to the inside of steel framed medicine cabinets and are the perfect solution to help organize cosmetics, make-up brushes, Q-tips, lip products, toothbrushes and more. They were recently featured in the “We’re Obsessed” August section of InStyle. A MagnaPod unit before it's attached to a medicine cabinet. 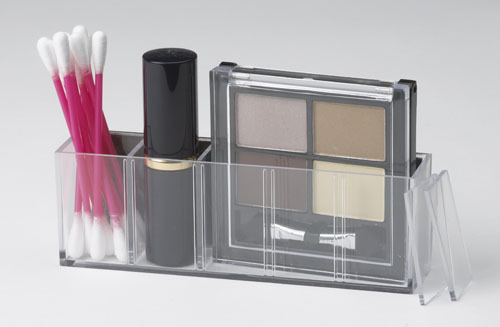 Available online at magnapods.com, MagnaPods™ Organizers are a helpful accessory for any bathroom that needs organization, perfect for apartment dwellers who do not have a lot of space, as well as those of us who simply can’t resist all those gorgeous makeup products and helpful little beauty tools. This entry was posted in On Our Radar, Uncategorized and tagged beauty, grooming, Magnapods. Bookmark the permalink. I think this blog is great and I hope that so called newspaper we now have realizes what they lost when they let you go! I am asking the site to notify me whenever you update it so I can follow along. This is the way to stay in touch with local products and businesses so we can support them. Great idea! I can so relate to that. Even beyond makeup, I could use the organizers for my jewelry making tools and beads. I agree, lets get organized. Finally! I have boxes and zipper pouches full of makeup. What a great idea for a magnet to be on the bottom so it adheres to the medicine cabinet!